This is a common WhatsApp error message if you using a Windows Phone. This is the error message. A quick check into my storage sense showed that phone memory is only 84 MB free space. There are some steps that you can try to free up space in Windows Phone as mentioned in the article. Though these are valid steps to free up available space, it didn’t work for me. This made me wonder if the problem was with WhatsApp. One of the problem with Windows phone is that the Apps are hardly updated. Compared to Android and IOS, Windows Phone is less popular with App developers. This is mainly because Microsoft is not sure if they want to continue support for Windows Phone software and instead concentrate on manufacturing phone hardware. Assuming the problem is with the installed Apps, I assumed the problem was with WhatsApp. So, WhatsApp was uninstalled. After removing WhatsApp, I turned off and turned on the phone. On checking Storage sense, the phone memory now has 3.06 GB of free storage space. After confirming there is enough free space, WhatsApp was re-installed. The installation worked without any problem. All my contacts and groups remained intact, but all messages were lost. But the files, pictures and videos send through WhatsApp was still listed inside Gallery. Click WhatsApp > click move to SD You cannot move WhatsApp completely to SD storage as this is not supported by WhatsApp developer. However, all the files, pics and videos will be moved to SD card using the step. If nothing is happening, it means WhatsApp is already configured to save files, pics and videos to SD card. If you have any other App or games listed inside apps + games, try to move them to SD card to free space from Phone storage. Once these steps are followed, check Storage Sense to see if there is enough memory inside Phone memory. If this didn’t work, follow the next steps. Once the uninstall is finished, switch off the phone. Turn it on again and check the free space in Storage Sense. If there is enough free space, it means the steps were successful and it was WhatsApp which was creating the problem. I cannot point out why WhatsApp create this problem, but it is most likely because of poor coding and lack of updating the App. Go to Windows Store -> search for WhatsApp > install WhatsApp. 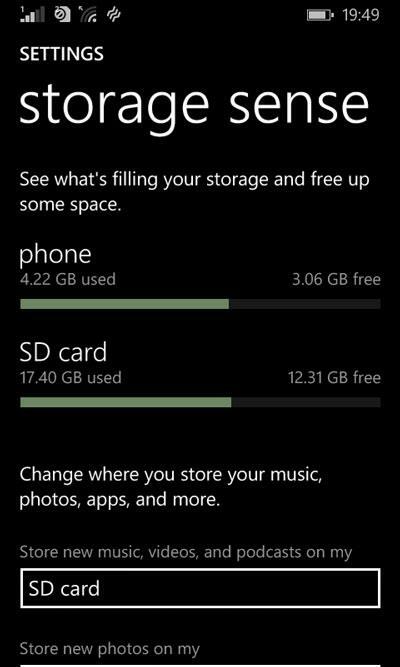 Here is how the storage sense shows the available free space on my Windows Phone after uninstalling WhatsApp.